I don't know, how I can download GhostText for Firefox 49.0.2, so I did not have to reinstall GhostText at each session in Firefox. click on Load Temporary Add-on and select the file browser/manifest.json inside my cloned project. Now GhostText worked for me, but if I close Firefox, I need reinstall GhostText. I don't want reinstall GhostText each time, I want install addon one time and use it. I can not search other solutions in Google. Last edited by Sasha_Chernykh on November 24th, 2016, 6:53 am, edited 1 time in total. @L.A.R. Grizzly, it is not «signing issue», unfortunately, your solution not helped for me. as written - it is "corrupt". so its content was modified for bad or the signature was broken. whatever you or he had done. The add-on will stay installed until you restart Firefox. So why is what you are seeing unexpected? If you want to use a modified version of [extension], you need to have it signed. Once signed, install it normally (not through the debugging mode) & it should persist. therube wrote: The add-on will stay installed until you restart Firefox. How I can install GhostText addon normally? May you say step-by-step? Addon for Firefox on Mozilla site is outdated. Only manually installed from GitHub repository worked for me. But I can install GhostText only as temporary addon. finally ask the author for a compiled version of his code. i read the manual but that is only for linux, this is like wearing blinders. Brummelchen wrote: finally ask the author for a compiled version of his code. I wrote to author Firefox addon 2 times one week ago, but I not get answer. i read the manual but that is only for linux, this is like wearing blinders. No, GhostText successful work on my Windows, demonstration. Link to the Demo does not work, goes to 404 page error. something wrong with these words? author only described it for linux, not windows. i dont know how to "git clone" for windows - and i give a f* on linux explanations. if content may downloaded here - then i know how to use it "temporarely". but i also know how to build extensions (in general), to modify and to sign extensions. if author refuses to build an extension, signed or not - his problem. at least only few people seem to use ghosttext because he has not done yet. @Brummelchen, see my build on AppVeyor. Build for Windows 32 was successfully. 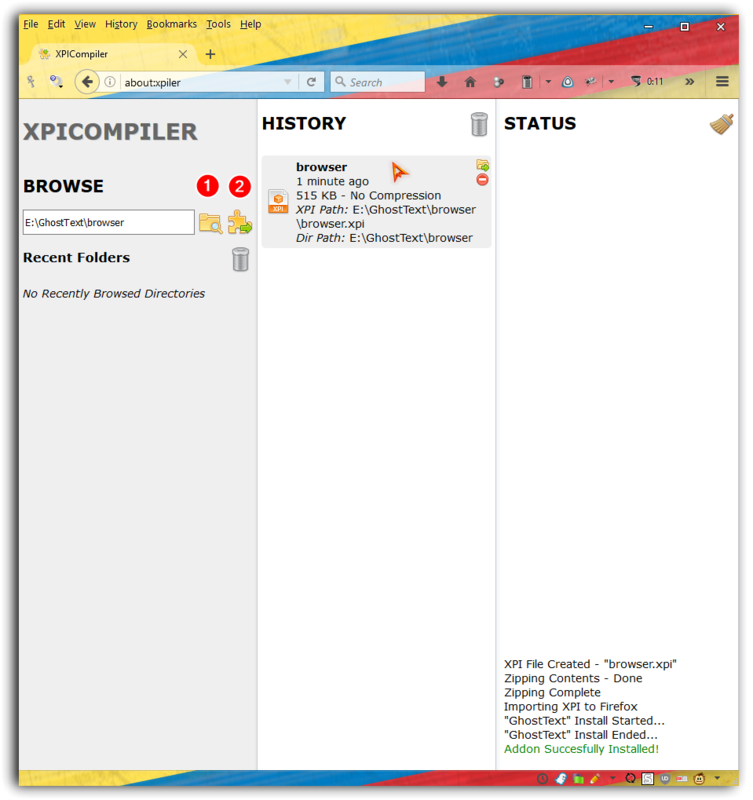 I can not compile xpi via jpm console utility, but I solved my problem use XPI Compiler addon. For those who know the Russian language, for more details, see my answer on Stack Overflow.